Scheduling your pins into Pinterest is a good idea for many reasons. Pinning little and often is one of the keys to success as are evaluating your analytics to determine your optimum pinning time and if you aren’t online that often, scheduling offers the flexibility and results you just might need. There are a number of scheduling tools available now for Pinterest but some charge a monthly fee, others are glitchy – I was determined to see if I could find a good scheduling tool that was free (even if just for moderate use). Here’s my evaluation of the three I experimented on. Update 13/11/2014 – Tailwind now have a scheduling tool and I’ve explained how to use the Tailwind scheduling tool here. I really like it! My new favourite. I used to use Gopixel, there is a charge but it is free for up to three pins a day at the time I started using it. However, they are having problems with connectivity to Pinterest and although I tried the bookmarklet tool in three browsers, I just couldn’t get the scheduling tool to work. A shame. I tried Pinwoot then. I didn’t like it. You have to pay for seeds or earn them by following others or repinning using the Pinwoot platform. I couldn’t work out how to schedule pins from my own website using Pinwoot (no bookmarklet tool available). The only way to do it is to search for a particular keyword e.g. red shoes and then schedule the pins that are presented to you. I just couldn’t see the point of this from a business perspective to be honest. Update: I was impressed that Alex from Pinwoot got in touch and said they were making some changes. Within a day or so they had published this blog post showing people how to use Pinwoot to schedule. Some people may complain that they have to buy seeds to schedule but these companies have to make money too – what is important is that it is a reasonable cost for small businesses and it works well. Pinwoot now has a schedule pins box on the left side and a ‘contact and help’ button if a user requires assistance too. You now drag your schedule button to your toolbar just like you did with your ‘pin it’ button. Once it is in place, you can schedule pins from any website very easily by just clicking on the ‘schedule pins’ button in the toolbar. If there are three pins on the page, select which ones you wish to schedule, you can then edit the text, choose a board and choose a time (there is a little slider across for the time, click on it to choose your time. Very easy and efficient. I’m impressed, Pinwoot, and even more so because you achieved it so swiftly. I also liked that you can schedule multiple pins from a website page or a post. For example, I might often have three images in a blog post – it is very easy to schedule all 3 images into three different boards (choosing which board is most relevant for each image) for three different times. Not only will I not be putting too many pins out at the one time, I can schedule for the optimum time of pinning if I wish, experiment with times and ensure that as many followers as possible will see my pins. Even though I am on the laptop most of the day, it is much easier to schedule pins when publishing one’s blog post. You can pay with seeds to promote the pin if you wish – more on that in another post. Well done Pinwoot. Formerly known as Pingraphy, it now seems to be the best scheduling tool out there. It does have a charge however. It offers a free trial for 14 days so I suggest you establish your ‘best time’ for pinning by using an analytics tool, sign up to Viraltag and try it out for 14 days and then decide if you would like to continue. 1. Sign up to Viraltag with your Pinterest details. 2. 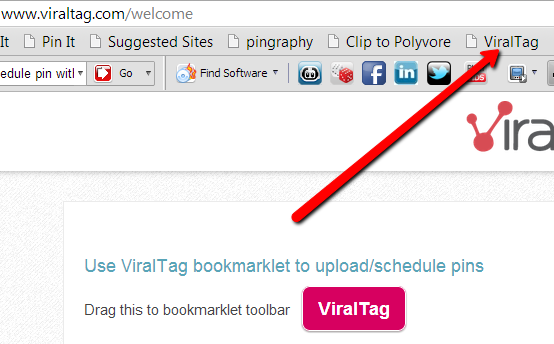 Pull the Viraltag bookmarklet tool up to the toolbar. Apparently it can be a bit glitchy in chrome but I find it works fine. If it is glitchy, try it in Internet Explorer or Firefox. 3. Go to your website page or blog post (or to another website if you wish to show your followers that you are a curator for quality content in your niche) and click the viral tag bookmarklet tool. 4. It will present all the photographs in that blog post or page. Click the images you wish to schedule. 6. The pop up box will present your chosen images. You can then choose the boards for those pins. They should have carried the descriptor with the board and the page url. Next click to choose a date and time. Viral tag offers the option of sending them out with a ten minute gap between each pin. 7. If you go to the dashboard, you can edit or delete any of the scheduled pins. That is it. 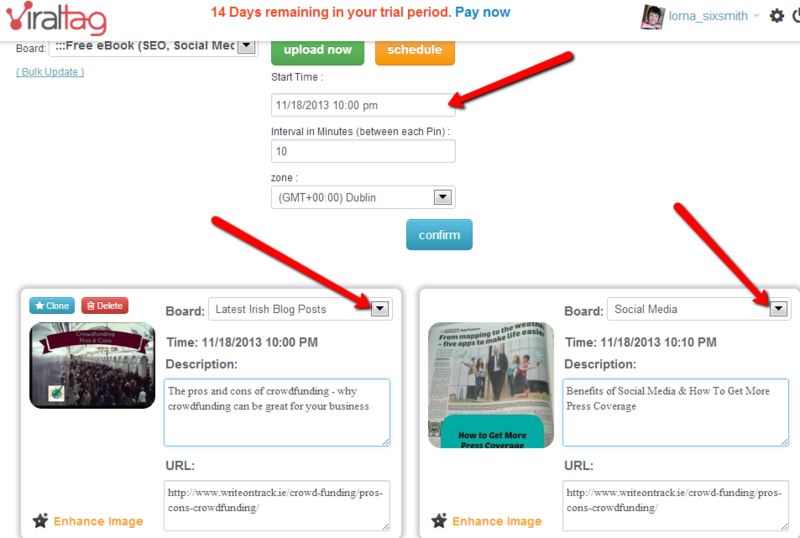 The cost of viraltag scheduling starts at $4.99 a month (after the first 14 day trial). I suggest you try an analytics tool (more coming up on these soon) to determine your best times for pinning, schedule using the trial for 14 days and then re-evaluate your analytics and see if it makes a difference to your repins and traffic. 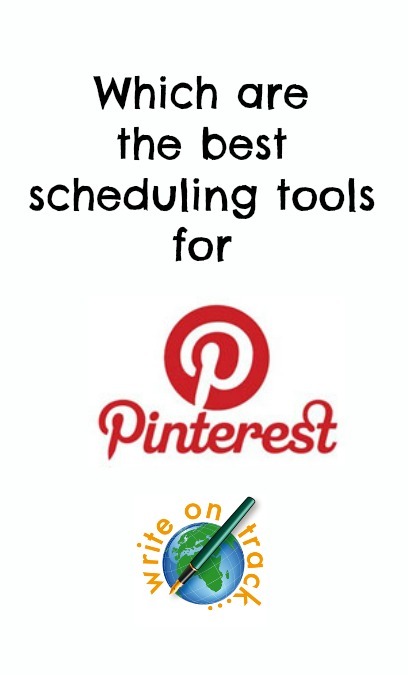 Have you found any other scheduling tools for Pinterest that are good? I’d love to hear about them. I hope gopixel is able to sort out its glitches as it was a handy tool. Thank you for giving Pinwoot.com a try and sharing your frank opinion/feedback. After reading your post, we worked all night to add some improvements to our Pins scheduler. You may now use our bookmarklet to schedule pins from anywhere on internet. Also, our Pins scheduler comes with free in-built Promote Pins features which automatically promotes your scheduled pins once they are pinned to get immediate Pins engagement and visibility or in simple words, repins and likes. You can schedule 30 pins per month for absolutely free. To schedule unlimited pins, a user may buy our smallest seeds pack for only one time. More improvements coming in soon. Well done Alex – great improvements and I just updated the post and will share it out more now. Apologies I didn’t get to do it before now but was launching my first book so this blog has been ignored all week. Are you able to upload a photo for scheduling in Pinwoot or does it have to a pin directly from a web site? I’m looking for something where I can upload my own photos, but schedule when they get pinned. I would like to share my terrible experience with Viraltag to hopefully save someone else from going through the same experience I went through! I signed up for their premium account because I wanted to manage two Pinterest accounts and view analytics for both accounts. For my primary account, it was stuck saying that analytics weren’t currently available for my account. When I tried to view analytics for my 2nd account, it told me I had to sign up for the premium service (which I already had). I had my credit card company cancel the payment because after giving their customer service ample time to respond (over a week) they still hadn’t attempted to contact me or resolve my issue. I thought everything was taken care of, but today they attempted to charge my credit card again. There is no way to cancel your subscription within your settings and no way to remove your credit card number from your account. If worse comes to worse, I will probably have to cancel my credit card to keep them from continuing to charge me for a service which I am not receiving. I just wanted to let people know what possible issues they’ll encounter with this service that sounds great until you attempt to use it. I was just about to signup. Thank you very much for sharing. You’re welcome – I wish there was a good Pinterest option out there. I bought some seeds and am using pinwoot at the moment. You definitely can schedule through it although it looks like you have to schedule a pin at a time which is kinda time consuming. Alex is very helpful though and I am sure he would implement any changes should he get enough requests for them. Thanks Ben, yes, I’m just about to try it out. It’s been a mad week and I’ve been meaning to try Pinwoot again and update the post. Glad to hear you found it useful. You can schedule any number of pins at a time. May I please know what gave that impression so that I can get it fixed by my team. Thanks for using Pinwoot and supporting us buying seeds. Sorry I should have been more clear. Alex what I meant is that, as we discussed, you can certainly bulk schedule pins but they use the board title and url respectively as opposed to each pins specific url and title. Actually i’ve been using it for months now, and I think some people want a perfect thing, which viraltag is not but it is still worth every dollar I’ve spent because I make 20 to 30 times that and I’m just starting out. It is worth it because Pinterest has truly prospered my blog tremendously. ViralTag is sometimes glitchy on appearance but on performance 9 times out of 10 it gets the job done. If you are not savvy on how to deal when it get glitchy then you might feel different. I have only had one real issue with them but they cleared it up in a single day, so everyone has story to tell. Thanks Rachel, that is a shame. I was pleased to see they offer a free trial as I signed up with another tool previously, had to give my credit card details before I got the free trial and of course, I forgot to cancel it before I was charged! I’ve tried all of the above and I must say ViralTag is my favorite! I like it for scheduling but not for buying followers. Much prefer to grow followers through quality content. I wonder will Tailwind bring out a scheduling tool? Hi Lorna! ViralTag doesn’t sell followers – it’s a big NO NO on Pinterest. ViralTag is coming out with an extensive analytics tool so it would be cool to see if it’s better than Tailwind. I love the concept of one stop shopping. Who do you use for analytics? 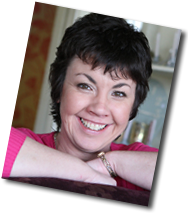 Have a fab day Lorna! Just looked at them again, they have changed their ‘seeds’ method I see which is good. They were offering to increase followers by buying seeds. I’m glad to see that is stopped. I use Google Analytics to monitor it as well as Tailwind and Pinterest’s own analytics. It will be interesting to see how ViralTag’s analytics works. Thanks Anna, I got confused between the two momentarily. I agree, I’m not so keen on the seeds of Pinwoot. However, they seem to be working hard to provide what pinners want re rescheduling. I do like Tailwind, would just use it if they add on a scheduling tool. Which package for Viraltag are you using? So you think the €4.99 package is sufficient for most small businesses. The $4.99 package is certainly fine for a small business owner. 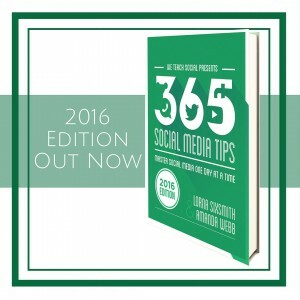 But if you’re a marketer managing multiple accounts your best bet is to upgrade. As soon as I get info about ViralTag’s new analytics I’ll let you know. “No credit card required. Just fill out the signup form and you’re in” This is not exactly the case with Pinwoot aka Viralwoot as I immediately was asked to choose a monthly pan and directed to paypal. I have been trying to sign up with viraltag. They said I was on the “waiting list” for th free trial. I emailed them asking for plans and pricing. They quoted me the lowest package they have available is $99/mo. That seems outrageously high. Anyone know anything about that? Strange that they now have a waiting list and that does seem v expensive. I just checked but because my free trial is over, it’s not letting me see what you are seeing. Unless you have a big brand, I think that is too much money. Time to look for another scheduling tool, I think, for the smaller businesses. Well, I just wanted to try Pinwoot, it redirected me to a site called Viralwoot and they ask me to fill in my Pinterest login and PASSWORD on their website. Yes, it changed its name recently. A lot of them do require your Pinterest account details alright. I just checked out ViralTag today and $29/month was the lowest-priced plan shown. Just thought I’d throw that out for anyone else looking. $5/month I can do. $30/month – well, I doubt I’d get a return on that investment. Yes, unless your business is sizable, it certainly adds up in terms of cost. So is ViralTag the only Pinterest publishing/scheduling tool available? Does anyone know if it uses an approved API from Pinterest? 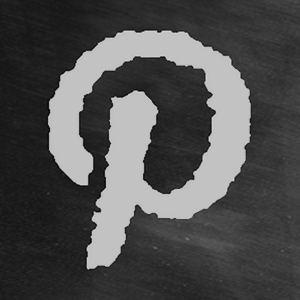 Tried all of the mentioned tools..my choice..PinPinterest!